October is Breast Cancer Awareness Month, and we at Legacy.com are dedicated to honoring all those whose lives have been touched by breast cancer. Two new features debut today on our site. One is a small but meaningful and lovely remembrance – a pink candle you can light on the Guest Book. For the month of October, you can light a pink candle in remembrance of a friend or family member who battled the disease, helped with the search for a cure, supported a loved one through illness, or was affected by breast cancer in any way. Today, we also unveil a new memorial site honoring those whose lives were touched by breast cancer. Over the years, we have published thousands of obituaries and Guest Books for those who have lived with breast cancer and those who have worked toward a cure. Today, we see those Guest Books together for the first time. We hope you’ll visit and help us honor them. 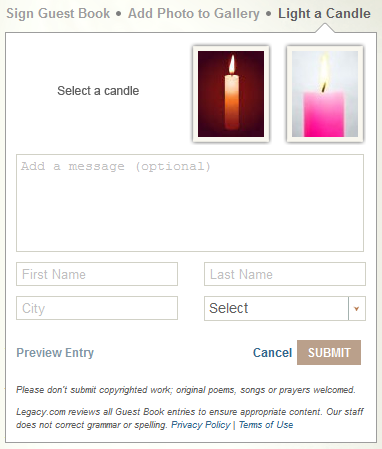 This entry was posted in In the News, Life at Legacy.com, New from Legacy.com and tagged Breast Cancer Awareness, Obituaries, Obituary Guest Books. Bookmark the permalink.